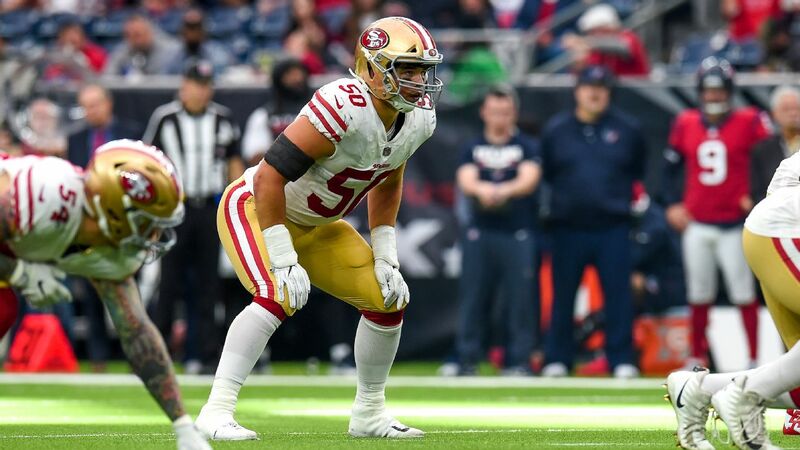 SANTA CLARA, Calif. -- The San Francisco 49ers' depth at inside linebacker took another hit Wednesday when the team placed Brock Coyle on injured reserve with a concussion and a broken bone in his back. Coyle left last week's loss to the Minnesota Vikings with a concussion, but Niners coach Kyle Shanahan revealed Wednesday that Coyle also suffered a T4 compression fracture in his back that will keep him out for at least the next six weeks. "I know that's very scary, always," Shanahan said. "It's six weeks until he can have contact again. He will recover some time this year but we know it's going to be at least six weeks before he can have a chance to play football." Coyle's absence is the latest at a position that has been tested early while waiting for projected starter Reuben Foster to return from a two-game suspension for violation of the league's policies on substance abuse and personal conduct. The Niners have also been waiting for Malcolm Smith to recover from a hamstring injury suffered in the preseason. Smith missed all of last season with a pectoral injury and has not appeared in a regular-season game for San Francisco since signing a five-year, $26.5 million free-agent contract in March 2017. Shanahan said Smith isn't going to practice Wednesday and he will be questionable for Sunday's game. Without Foster or Smith available, rookie Fred Warner started at middle linebacker against the Vikings with Coyle on the weak side. Coyle finished with six tackles against the Vikings before departing because of the injuries. Elijah Lee replaced Coyle and is likely to get a chance to start alongside Warner this week against the Detroit Lions. With Coyle out, the 49ers added some depth at linebacker Wednesday by signing Terence Garvin, who appeared in 15 games for the Seattle Seahawks last season. In 74 career games, Garvin has made four starts with 27 tackles and 1.5 sacks. He also has 49 special-teams tackles in time with the Seahawks, Washington Redskins and Pittsburgh Steelers. In addition to signing Garvin and placing Coyle on injured reserve, the Niners promoted offensive lineman Najee Toran from the practice squad to the active roster and signed receiver Frank Stephens to the practice squad. Because Coyle's injury could heal well before the season ends, he is a candidate to be one of the team's two players to go on short-term injured reserve and return to the roster. The Niners don't have to make that decision until he's closer to being healthy.